Lava domes can be divided based on their shape, texture and eruptive style. 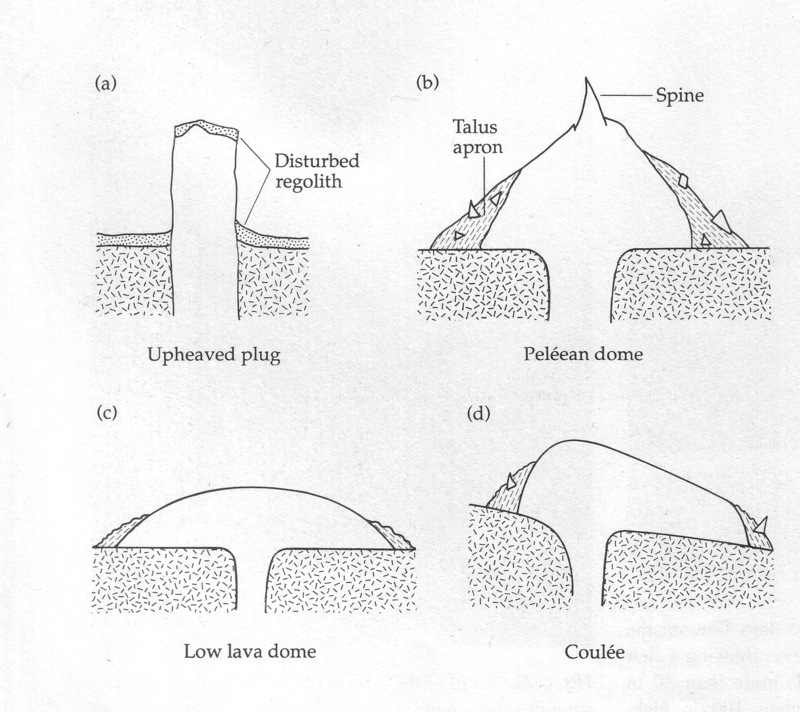 For the purposes of this overview we have chosen to stick with the Blake (1999) classification of lava domes, based primarily on morphology. See figure left. The four major types are Low Lava Dome (or Torta), peléean, coulées, and upheaved Plug . Named after their striking resemblance to cake or “Torta”, these domes are common throughout the world, but especially so in the Andes mountains of South America. This type of lava dome is generally erupted on mostly flat ground and as a result the lava is able to push outwards, but not far. They typically are flat-topped and roughly circular. The thickness and diameter of these domes can vary greatly from a few meters to nearly a kilometer in thickness and several kilometers in diameter. These domes grow by internal processes and lava fills in the center of the dome near the vent and pushes older layers outwards, forming an onion-like internal structure. Photo credits: Casey Tierney (Left) and Google Maps (Right). Chillahuita is an excellent example of a torta. Note the steep sides and the flat top. Named after the iconic lava dome formed on Mt. Pelee in 1902 (which eventually collapsed resulting in the destruction of St. Pierre on Martinique), these lava domes are often the steepest sided of all lava domes. They are typically circular similar to Tortas, but rather than having a flat top, they show relatively smooth upper surfaces punctuated by tall vertical spines . These vertical spines give these domes a craggy appearance and also frequently collapse causing talus slopes to frequently surround these domes. This type of dome is most commonly found associated with larger composite volcanoes. The large spine growing out of the 2004-2006 Mount St. Helens lava dome makes it an example of a Peléean lava dome. Coulées are a hybrid between a lava dome and a lava flow . In order to get the thick and sticky lava to flow, this type of dome is generally erupted on steep slopes which allow the lava to ooze slowly down the slope. Typically they do not flow more than a few kilometers, though some larger examples have traveled well over 10km. 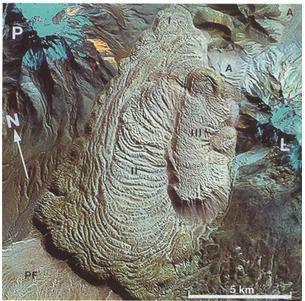 As a neat feature of coulées, huge pressure ridges, known as Ogives, are often seen on the outer surface of the flow. Photo credit: Shan de Silva. Chao, located in the Andes, is an excellent example of a coulée. 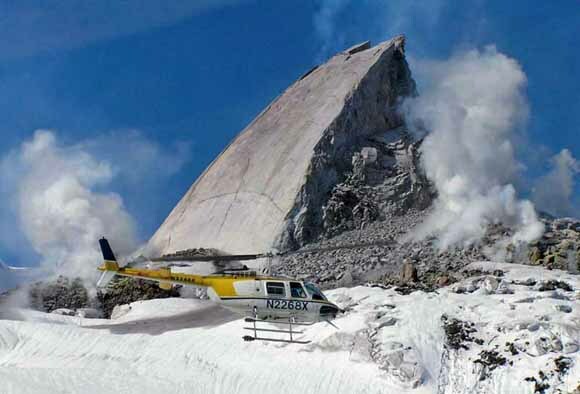 It was erupted on a very steep slope which allowed it to flow for nearly 14km downslope. The flow front is over 700m high. Note the distinct Ogives on the surface. Upheaved Plugs are a rare and interesting type of lava dome. The erupting lava has a higher yield strength (thus is stronger) than the lavas that form other domes, and as a result this lava is pushed up like a piston. These piston like extrusions often travel high above the surface and sometimes carry country rock sediment along with them. Photo from Francis, P., Oppenheimer, C. 2004. Shinzan dome in Japan. Masao Momatsu recorded the stages of growth by drawing on his window overlooking the dome. Related to lava domes is a volcanic feature known as a cryptodome. A cryptodome occurs when magma is brought very near the surface but does not breach to the surface. This shallow intrusion of magma forms a bulge on the surface, closely resembling a lava dome. Fink J. H., Anderson, S.W. 2000. Lava domes and Coulees, In: Sigurdsson et al., eds., Encyclopedia of Volcanoes, Academic Press, 307-319. 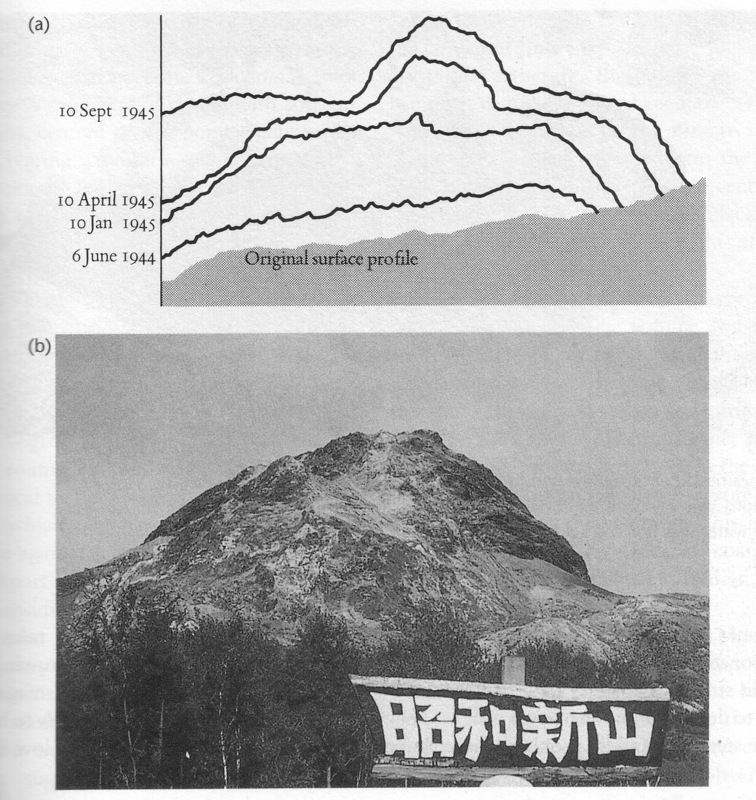 Blake, S., 1989, Viscoplastic models of lava domes, IAVCEI Proceddings in Volcanology, Vol.2. Lava flowsand domes, Springer Verlag, Heidelberg, 88-126.
de Silva, S.L., Self, S., Francis, P.W., Drake, R.E., Ramirez, C., 1994. 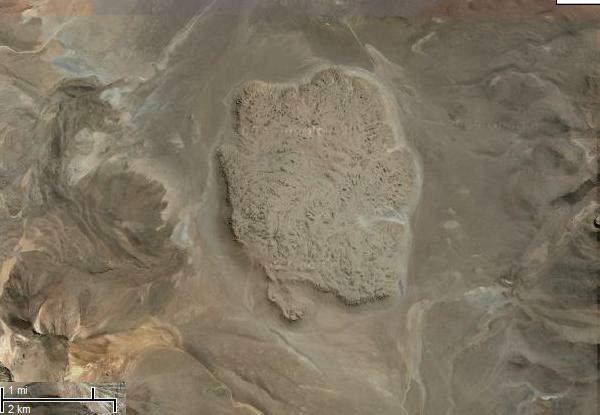 Effusive silicic volcanism in the Central Andes: The Chao dacite and other young lavas of the Altiplano-Puna Volcanic Complex . Journal of Geophysical Research, 99, 17,805-17,825.